Your chance to win with Snozone and TOG24! Get set for winter with this amazing prize package from Snozone and TOG24 worth up to £530! Win a Ready, Steady, Snow! lesson package from Snozone and your choice of snow outfit from TOG24 – together worth up to £530! To be in with your chance of winning this amazing prize, visit our Facebook page. and LIKE and SHARE our competition post before midnight on Sunday 23rd September. *This competition is not open to any Snozone or TOG24 employees or immediate family members. The 1st prize winner may choose from one jacket and one pair of salopettes from the TOG24 online winter 18/19 range, subject to availability. The TOG24 base layer prize consists of one thermal top and one set of thermal leggings. The Snozone Ready Steady Snow! lesson package consists of 9 hours of group lessons (at any level) which may be taken as 3 x 3 hour combined or 6 x single 90 minute lessons. The Snozone Ready Steady Snow! 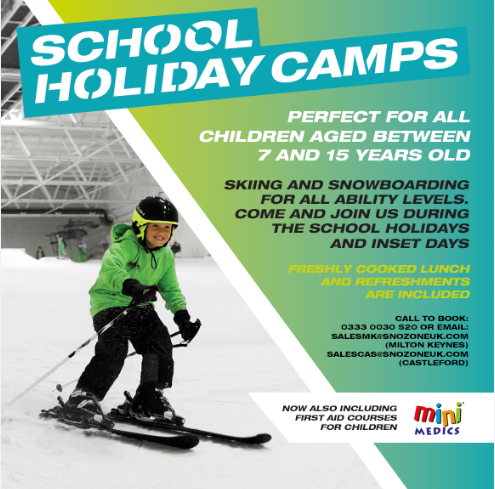 lesson package, group snow sports lesson and 2 hour slope prize must be booked and redeemed by 31st December 2018. Winners will be announced on the Snozone and TOG24 Facebook pages at midday on Wednesday 26th September. The judges decision is final and winners must respond by midday on Friday 28th September to accept their prize or it will be offered to another entrant. No cash alternative and the Snozone lessons or slope passes are not available for resale. Next Next post: Give the Gift of Snow with our great value lesson package!